Text and selection by García de la Torre Arquitectos. Illustrations by Meneo. Many architects have left their mark in Bilbao throughout its history. Before its transformation in the late twentieth century, luminaries such as Severino Achúcarro, Eugenio María Aguinaga , Ricardo Bastida, Enrique Epalza, and Pedro Ispizua designed remarkable commercial, civic, and residential buildings, sometimes from their private practices and others as head architects of Bilbao. 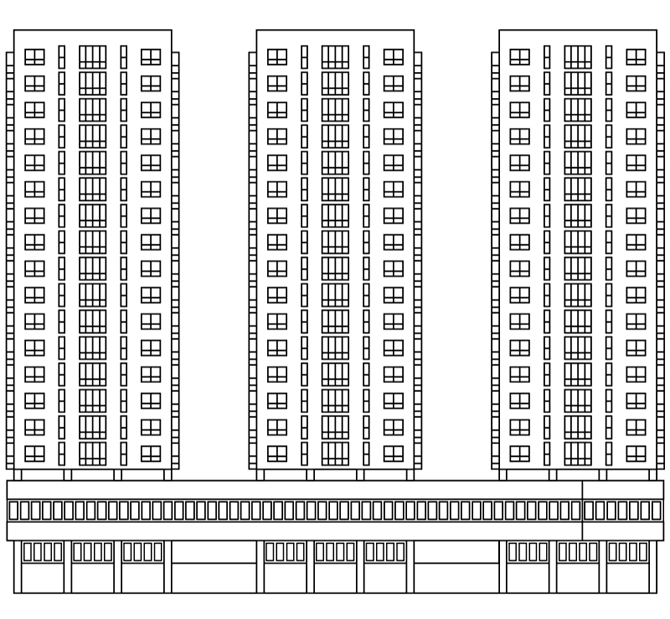 Francisco J. and Bernardo I. Garcia de la Torre look at seven buildings by seven architects that are paragons of the architecture of the city during the twentieth century. The Concordia railway station opened in 1902 and occupies a strategic location in Bilbao: next to the Estuary, across from the Old Town, and in open dialogue with the Arriaga Theater and its surroundings. It was built according to the original 1893 plans by the engineer Valentín Gorbeña and the 1898 plan by the architect Severino Achúcarro, who designed the façades. The station is comprised of two separate zones: Concordia (passengers area) and Amézola (goods area), and is the terminus for the Zorroza-Bilbao line. The layout—infrequently seen in the rest of Spain—is a singular example of a fruitful collaboration between engineering and architecture. It borrows from the first English railway stations while synthesizing the style of a Berlin railway station, with its island platform and pithead loading platforms. The architectural contribution by Severino Achúcarro gives form and expression to the railway station, lending it an urban and monumental personality. 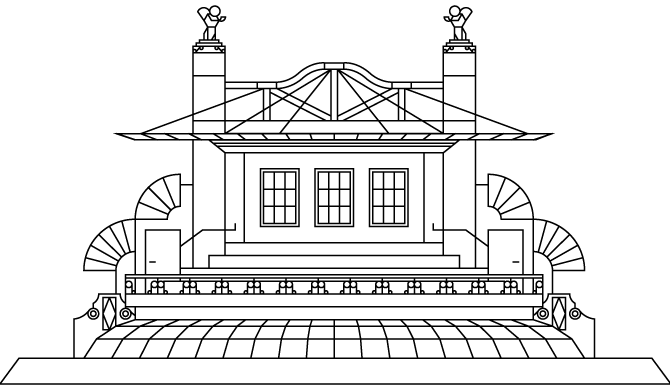 A curved roof, crowned at one end with a rotunda, substitutes the canopies that during the age of steam engines covered the track bed. The riveted metal structure is found in the lobby and throughout the building. The waiting area, unusual in railway architecture, forms a lookout over the old part of Bilbao and is designed like a loggia with columns upon a stone wall and offices at one end. The façade of the lobby contrasts with the waiting area in a perfectly integrated composition. 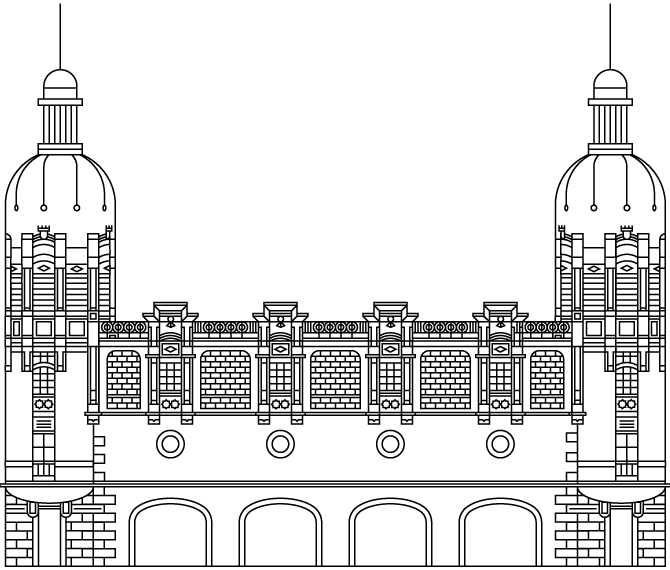 It has three openings, the middle of which is crowned with a metal and glass fanlight (recalling the Viennese buildings of the time) and the two laterals symmetrically adorned in stone. The station has undergone several reforms. Architect Yago Bonet Correa restored the station in 1993 to its original essence by prioritizing and revitalizing the lobby, a covered public square providing a pedestrian transit zone between the Old Town and the Ensanche area. He reclaimed the original riveted metal structure and the platform shed, and he added new facilities. IMB Arquitectos completed the final renovation in 2007, restoring some existing elements and providing passengers and passerby with an organized lobby and new commercial spaces. Severino was a key architect and urban planner during the city’s transition from the nineteenth to the twentieth century. After receiving his degree in 1866, he participated in the Plan of the Ensanche (Extension of the urban growth area) in Bilbao in 1876. The majority of his professional work was done in Bilbao, in the historical Old Town as well as the newly developing Ensanche area. He participated in the architectural trends of the time: Neo-medievalism, eclecticism, and modernism. The body of his works continues to serve as a testimony to these particularly fertile and creative moments in the history of the city. Some of his particularly unique and noteworthy works include the offices of the Society “El Sitio” (presently the Bidebarrieta Library), the neo-Gothic façade of the Santiago Cathedral, and the La Concordia railway station linking Bilbao and Santander. The construction of this significant project in Bilbao came at the turn of the nineteenth century when the new community hospital in Basurto replaced the old Atxuri hospital. In the span of the 90 years between the construction of both hospitals, there was a significant change in attitude towards the style of buildings designed to meet similar needs: a strong and compact building in the case of the Atxuri hospital designed by Gabriel Benito de Orbegozo, and separate pavilions surrounded by gardens in the case of the Basurto hospital designed by Enrique Epalza. The new decentralized plan introduces a model already in use in Europe throughout the nineteenth century that broke with the neo-classical concepts of hierarchical organization. The pavilions are distributed symmetrically upon a central axis. Each side has independent pavilions, each housing different medical specialties. The administrative offices are located in a building at the front entrance of the hospital. As for the exterior architectonic aspects, Epalza gave the work a popular and domestic style with sloped, colored roofs and wide eaves. The use of ceramic materials such as brick or mosaic tile and the treatment of the façade lends an almost neo-Mudejar style that takes a few steps towards modernism. Still in use as a hospital, several pavilions have been renovated and new ones have been added following the stylistic guidelines of the original ones, planned by one of the key figures in the cultural changes since the turn of the century. The majority of his professional career took place in Bilbao, both publicly in his position as the municipal architect and Head of Public Works for the Bilbao City Council, as well as privately during the very interesting period of transition from the nineteenth to the twentieth centuries. In the area of urban planning, he drew up the maps of the city limits and the first proposal for the expansion of Bilbao, the Ensanche. With a great concern for health issues, he shared his knowledge in theoretical articles and in projects, of which the Basurto hospital is one of the most important. Other noteworthy projects include the residential buildings at the Uribitarte ramps, the La Cruz neighborhood, the expansion of the Banco de Bilbao headquarters in the San Nicolás Square, and his participation in the Iralabarri neighborhood. 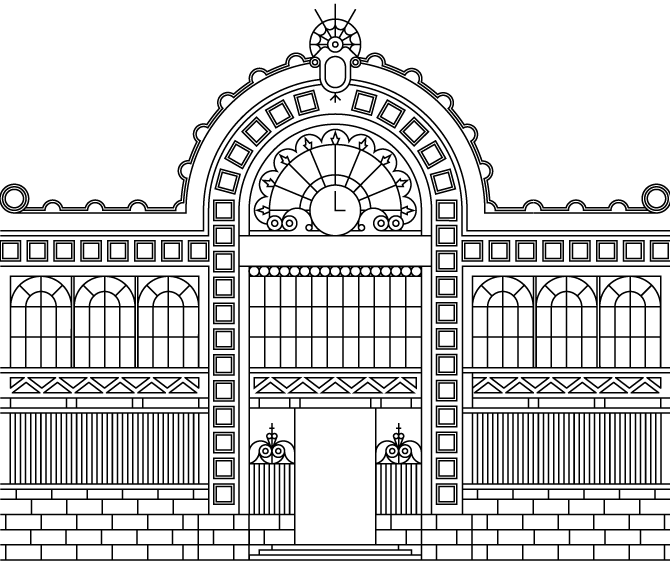 The municipal wine warehouse occupies an entire block of the Indautxu neighborhood, on the border between the original Ensanche and its later expansion beyond San Mamés Boulevard. This unique and monumental building possesses several remarkable features including the ground floor divided by three wide lanes with elevated walkways for loading and unloading directly from carts, and the careful analysis of the utility of the interior. All of this was done in keeping with Bastida’s original concept: the careful design of the exterior and its urban presence. For the project, he used low-maintenance, inexpensive, and modest building materials such as man-made stone, grey slate, and brick. The building was restored after a fire in 1919. In 1977, the Alhóndiga ceased its operations and the wine stores were moved to a new building in Rekalde designed by Félix Iñiguez de Onzoño. In 1988, the futuristic idea “Cube of Gorordo” was developed to turn the building into a cultural center. Designed by architects Francisco Javier Saénz de Oiza and Daniel Fullaondo with sculptor Jorge Oteiza, it was never realized. Ultimately, the architectural department of the municipal government and the French designer Philippe Starck designed a proposal to use the building as a cultural and leisure center. Construction started in 2001 and the new facility opened in 2010. The façades have been preserved and, because of their architectonic relevance, they have been carefully restored. Thus, the building preserves its role in the city fabric. The inside is an entirely different matter, where Philippe Starck gave free rein to his imagination, creating a new urban environment, in essence a stage, a city within a city. The new design includes three interior cubes as well as forty-three columns by Lorenzo Baraldi. The Arriquibar Square has now become the main entrance to the building. The building, once envisioned by Ricardo Bastida as a large container and warehouse for the new city then being built, is now, a century later, an important center for culture and leisure. In 2015, it was renamed Azkuna Zentroa in honor of the late Mayor Iñaki Azkuna. In 1901, Ricardo Bastida received his degree from the School of Architecture in Barcelona, where he was a student of Domènech i Montaner. It was most likely there that he developed his interest in modernism, an influence that can be seen in his two public laundries on Castaños Streets and San Mamés Boulevard. He was an important figure in Bilbao near the end of the nineteenth century and the first half of the twentieth century, taking different roles as an independent professional, Head Architect of Public Works in Bilbao, Diocesan Architect, Deputy Director of the School of Arts and Trades, and Senior member of the Professional Association of Architects, among others. He demonstrated a great interest in urban development and issues of function and maintenance of the buildings. 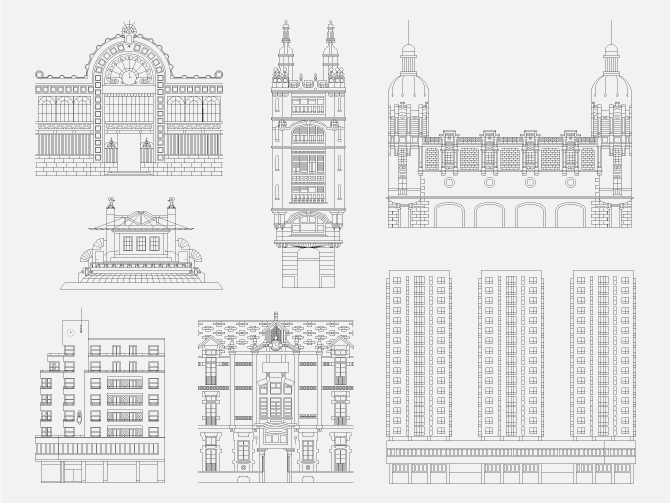 He used a variety of architectural languages in his buildings that include the Alhóndiga, public schools in Ribera and Indautxu, the Olimpia Cinema, Miguel de Unamuno Secondary School , and the Urízar Tower residential building. The abundance of multifamily buildings dating from around the 1920s signaled a change in Bilbao’s residential architecture, at least partly motivated by the second generation of the Ensanche. The exception was Allende family’s private property in Indautxu, designed by architect Leonardo Rucabado. The Sota Houses are the best examples of bourgeoisie or luxury neighborhood houses done in regionalist style with Cantabrian mountain-style influences, characteristic of Leonardo Rucabado. These houses, designed in 1919 by Manuel María de Smith, were intended to recreate the comforts of a single-family bourgeoisie house. The rooms open onto the main façade and the bedrooms face interior patios with kitchens and service areas. Initially, Sir Ramón de la Sota, a prominent and wealthy layer and businessman, intended to build on the entire block, including a private alley and interior gardens. However, his efforts were unsuccessful, even with a second attempt after the part of the building facing the Gran Via had been constructed. Born in Bilbao, Manuel María de Smith Ibarra completed his studies at the School of Architecture in Madrid in 1904. He is the author of a large body of work built during the first half of the twentieth century and developed in a variety of styles, including regionalism, English, neo-medieval, eclecticism, and rationalism. He left his mark with important works such as the Aortas Palace, the Carlton Hotel, the Sota-Aznar offices, and the Atxuri station. Bermeo architect Pedro Ispizua was a prolific architect during his long professional career. A drawing enthusiast, he took pleasure in this project by creating a series of sketches leading up to this unique work: a very expressive round bandshell with overhanging roof. An initial 1923 design was never built due to financial reasons. The second project by Ispizua, who was Bilbao’s municipal architect, was ultimately built replacing a more classical and traditional bandshell. The new design provided original solutions to the issues of acoustics, function, and construction: a light, overhanging cable-stayed roof allowing spectators to view the entire stage; the use of a metal structure; and the integration of ornamentation. The building is more modern than earlier styles of bandshells, incorporating an innovative and urban look. Perhaps the origins of the unique and productive career of architect Pedro Ispizua can be found in the traditional fine woodworking of his family. He studied under Domènech i Montaner and collaborated with him during his years of study at the School of Architecture in Barcelona. In Bilbao, he left an important body of private projects and public works, particularly in the school buildings that followed the guidelines established by Ricardo Bastida. The Arenal Bandshell and the Ribera Market are two of Ispizua’s most remarkable projects. His creative genius goes beyond any attempt to reduce his work to the styles or fashions of his era. With time, his talent is earning its proper due with the rediscovery of the unequalled perfection in form found in his work. Over time, the Ensanche area of Bilbao developed with residential buildings, bank headquarters, and a variety of businesses, including insurance companies like La Equitativa. These businesses sought out prime locations, on the Gran Via or nearby streets, and on several occasions faced onto a minimum of two streets. The Equitativa is a remarkable project by architect Manuel I. Galíndez. See the interesting and balanced design of its volume, the intelligent delimitation of its spaces, and the detail used in response to construction issues. It is at the same time unique in keeping with its surroundings, a trait found only in a few rare and noteworthy buildings. As stated by Galindez himself, “On the ground floor, windows have been used all the way across, for better natural lighting, and using the maximum heights allowed by the City. 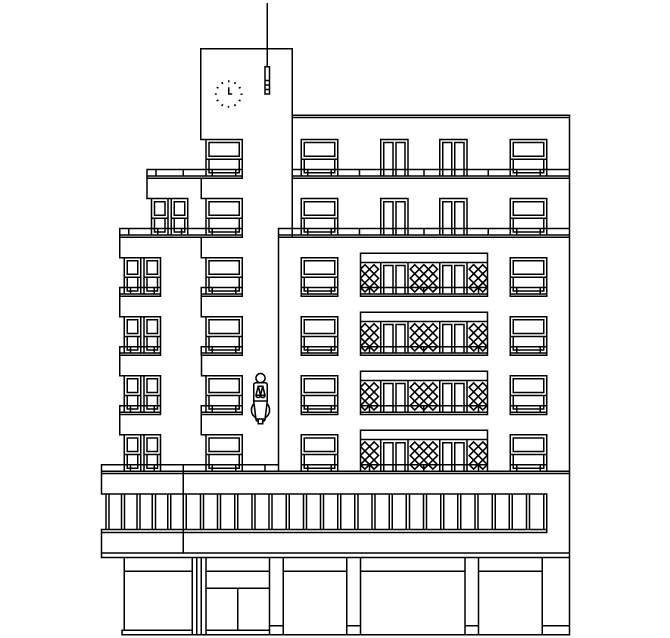 The location has also been the deciding factor in the general layout of the building. Our classic 5-meter chamfer has the common, and almost monotonous, use of symmetry on the corner with an important theme formed on the bisection of the angle of two façades. Towers, turrets, steeples, and lately curved lines have been our concern in similar cases. Reasonably, this should correspond with a certain balance between the streets that form the angle with good vantage points for the chamfer. 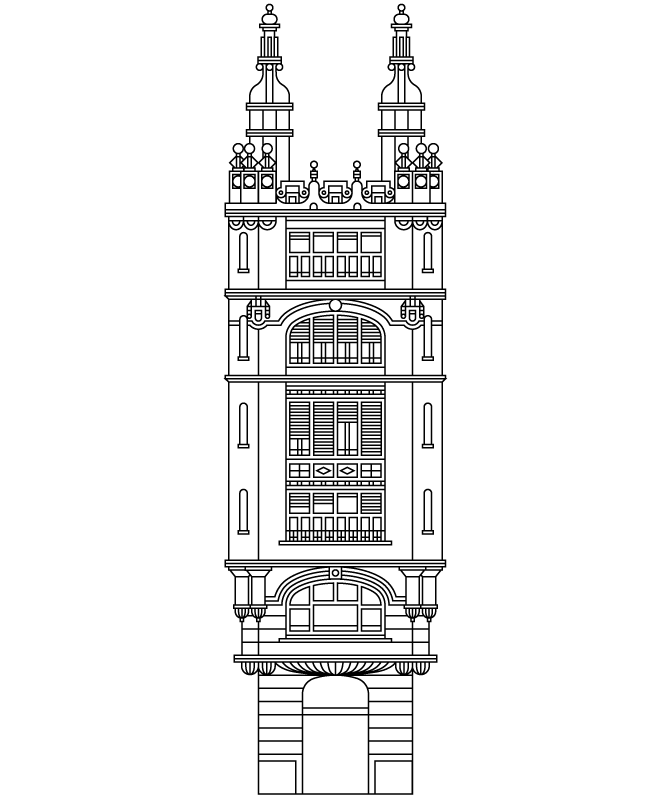 But in this case, none of theses circumstances apply: the streets are somehow narrow and, above all, the primary views that have to be considered in the study are from Gran Vía, with a straight view of the left façade. And, on the other hand, I think it is even more important that the main views are from the Albia Gardens, straight views of the front façade and angled views of the chamfer facing. These reasons, along with the ground plan designed using a certain balance between the two sides of the residence have led me to adopt the use, to put it that way, of a double angle. 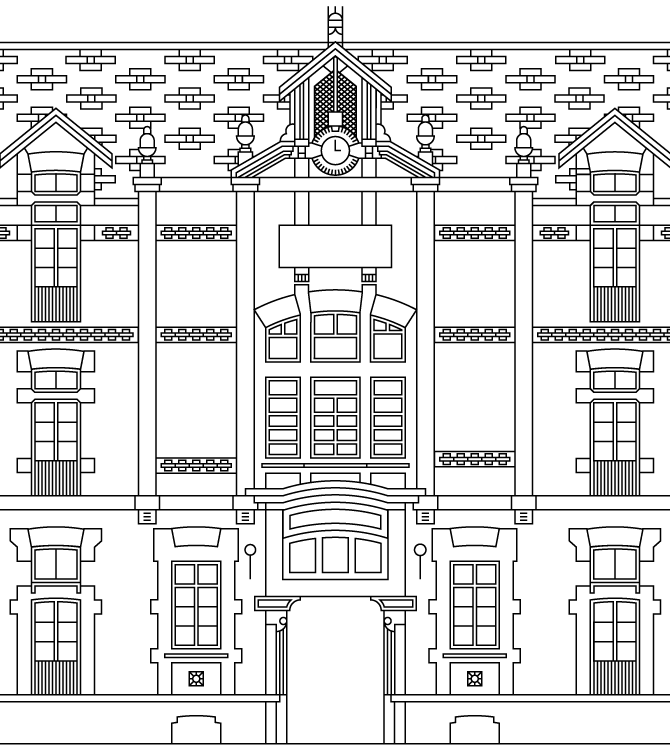 Aside from these reasons, which we could call technical, we have tried to give more monumentality and detail to the façade than that of a residential house, furthermore applying elements not used for a residence, such as a tower, clock, flagstaff, and a large panel for signage. A simple inspection of the façade defends, for the overall design, the use of stone. After receiving his architectural degree in Madrid in 1918, Galíndez started as an assistant to Ricardo Bastida in Bilbao.Throughout his professional career, he worked in a variety of trends and styles, including regionalism, neo-Basque, rationalism, and classicism. His great sensibility stands out in three areas: the plans of his projects; the use of materials and textures; and the relationship between his buildings and their surroundings, always ready to offer interesting urban solutions to the city. He collaborated on many of his works with his nephew José María Chapa, also an architect. Although he worked in the Biscay province and in the rest of the country, it was in Bilbao where he left important examples of his creativity in works such as homes on Plaza Arrikibar and Alameda de Urquijo, and buildings for the Equitativa, Aurora Polar, Iberduero, Naviera Aznar, Torre de Bailén, and Banco Hispano Americano. The towers are slightly offset on the ground plan and connected by a shared podium used for offices. The façades are finished with panels measuring 90 cm of a light-colored stone veneer. The building maintains its modern image decades after its construction, a feature found in other works by Aguinaga in Bilbao. Born in San Sebastián, he studied in Madrid and spent most of his professional career in Bilbao and the Biscay province. He is an important figure of the post-war era in Bilbao and the architectonic mastermind behind the shaping of the Neguri neighborhood in Getxo. All of his works demonstrate a mastery of design and construction. Some of his projects include residential buildings on Elcano Street, Gran Vía Avenue, Etxezuri, and Zabálburu, as well as the Galea Golf’s clubhouse. His son Eugenio has followed in the family trade. García de la Torre Arquitectos is the architecture office founded by brothers Francisco Javier and Bernardo I. García de la Torre in 1977. Based in Zalla, Biscay, their work ranges in scale and typology from residential developments and sport complexes to cultural institutions and building renovations. They also work in the fields of graphic design, interiors, urban planning, research about architectural and cultural heritage, and publishing. They are the authors of several books, including Bilbao: Arquitectura / Architecture (gt., 2009) and Bilbao: Nueva Arquitectura / New Architecture (gt., 2014). Meneo is a graphic design studio based in Bilbao founded in 2010. They develop projects related to art, culture and fashion which include publications, digital media and visual identities. Their design ideas are simple and effective, understanding design as a source of learning and joy.